PowerStream is Ontario’s second largest municipally owned electric utility, with 375,000 customers spread across 15 communities. Recently, it has begun an experiment with the so-called internet of energy. 20 residential properties in Toronto’s Richmond Hill neighborhood will have solar panels and small battery systems installed. All 20 systems will be tied together and operated as a single system using batteries and software provided by Sunverge of San Francisco. The integrated system will be marketed under the name PowerHouse. “We are the first to do this in Canada,” Neetika Sathe, vice-president of smart grid technologies at PowerStream tells the Toronto Star. 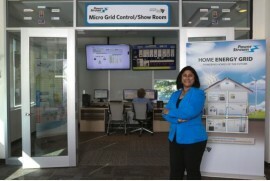 Eventually, she wants to see the system made available to all the company’s utility customers. The first 20 homes will be networked together like computers in an office, allowing PowerStream to control all of them as if they were a single system. In effect, they will become a zero-emissions neighborhood power plant. If hundreds or even thousands of homes and businesses were networked together, they would create a virtual power plant. If the system were applied to 100,000 homes, it would completely replace the need for an entire coal-fired generating facility. For participating customers, the PowerHouse plan offers the potential for lower electric bills and the comfort of knowing that most of the energy a home uses is coming from clean, renewable sources. A handy mobile app will inform homeowners when their system is generating solar power and the charge status of the battery. Customers will also benefit from having access to stored electrical power in the event of a grid outage. PowerStream benefits by having control over all battery systems and being able to decide how and when that stored energy can be used to support the local grid. “If we have a storm alert and know there’s a chance of trees falling on wires, with the click of a button we can tell all these battery systems to charge up because we may need them for backup later,” said Sathe. Ken Munson, chief executive officer of Sunverge, said the software does more than just monitor and control solar panels and batteries. It can also manage the home charging of electric vehicles and the operation of smart thermostats and other devices that are becoming part of the automated home. A customer pays an upfront fee to join the PowerHouse system and a small monthly maintenance fee. PowerStream pays for all the solar panels, batteries, and software. The more people sign up, the greater the benefits for all users will be. The utility expects customers will save enough on their utility bills to recoup the upfront cost quickly and cover the monthly service fee. This initiative clearly illustrates the difference in attitude toward solar power that municipal-owned utilities have as opposed to investor-owned utilities. The later are digging in their heels and being dragged, kicking and screaming, into the new world of renewable energy. Municipalities tend to embrace the change and seek out ways to introduce solar power in a way that benefits customers and the utility companies themselves.